Vital to life, water has been considered sacred by cultures throughout history and across the world. That’s particularly true in regions where it is scarce, such as North Africa and Morocco, where, in light of the impacts of climate change and global warming, government, multilateral development organizations, private sector investors and local communities are looking for ways to forge alternative pathways for inclusive sustainable development. Aiming to lessen the impacts of warming temperatures, the increasing frequency of drought and other climate change costs and threats in Morocco, Spanish multinational sustainable energy and environment multinational Abengoa announced on May 30 that the North African country’s National Electricity and Drinking Water Office (ONEE) awarded it a contract to build what is to be Morocco’s largest desalination plant. Located in the rapidly growing city of Agadir, on Morocco’s Atlantic coast, the plant will employ cutting-edge pre-treatment filtration and advanced reverse osmosis to produce some 100,000 cubic meters of drinking water per day. Climate change models and studies of global warming’s effects in different regions around the world indicate that Morocco is among the countries more likely to face growing threats and costs. Increasing concentrations of carbon dioxide (CO2) and other greenhouse gases in the atmosphere will contribute to a forecast average annual national temperature increase of 1.5-2.5ºC (2.7-4.5ºF) above current levels for the period 2021-2050 and higher thereafter, according to “Climatic Change and Drought Mitigation: Case of Morocco,” a study undertaken by Mohammed Karrou of INRA, Morocco’s agricultural research agency for the U.N. Food & Agriculture Organization (FAO). Potential impacts include an increase in the frequency of drought and a reduction in the growing season for crops, a trend that has already been noticed. Drought in Morocco occurred once every five years prior to 1990 but once every two years from 1990-2000. Freshwater supplies in Morocco’s Rheraya watershed are already being adversely affected by climate variability, and conditions are expected to worsen further given anticipated climate change impacts. In a climate change and adaptation study published in the January 9, 2012 edition of Water, researchers forecast a 2-3ºC (3.6-5.4ºF) increase in temperature and a 40-60 percent reduction in precipitation with respect to baseline measurements. Compounding these risks is sea level rise and a resulting increase in coastal erosion, along with conventional, “business as usual” approaches to economic growth and development. Intensive development of large-scale luxury hotels, resorts and residences along Morocco’s northeast Mediterranean coast is already threatening to compromise the “vitally important ecological, social and economic functions” ecosystems there provide, researchers conclude in a study published in the July 19, 2014 online edition of the Journal of Coastal Conservation. Noting the essential nature of water availability and intact beaches for coastal tourism development plans to be realized successfully, and in any manner that can be considered sustainable, the report authors point out that “the water situation is already critical.” They urge government agencies, ministries and leaders, as well as private sector investors, to reconsider development plans within a broader, integrated framework that includes a thorough and rigorous assessment of current and future climate change impact and adaptation scenarios. Though expensive and energy-intensive, water desalination plants are increasingly seen as a viable means of boosting crucial freshwater supplies given present-day, as well as future, impacts of climate variability and global warming. Awarded the contract to build what is to be Morocco’s largest water desalination plant in Agadir, Abengoa’s project plan entails construction of a plant that employs ultra filtration pre-treatment to optimize freshwater production via an advanced process of reverse osmosis. 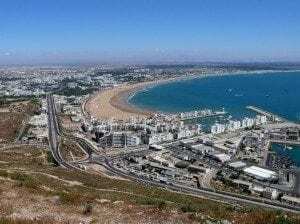 Projected capacity of the plant is 100,000 cubic meters of drinking water per day, which will be distributed across the Greater Agadir area, where rapid development, particularly in the tourism, agricultural and industrial sectors has been taking place. Under the terms of the €82 million (~US$111.5 million) government contract, Abengoa will be responsible for the design, technology and construction of the plant, as well as operations and maintenance, for a 20-year period. 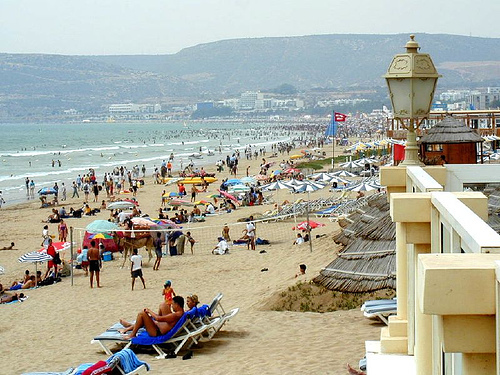 For the record Agadir is not on the Mediterranean coast, but rather on the Atlantic Ocean (“Agadir, on Morocco’s central Mediterranean coast”). Thanks for the clarification. We’re making the change.